Tycoon Bryan White has been arrested over attempted murder. File photo. 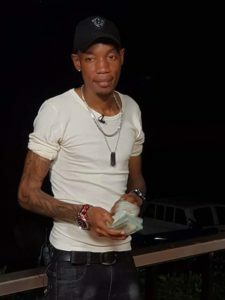 KAMPALA--Renown city socialite Brian Kirumira aka Bryan White has been arrested over attempted murder. PML Daily has learnt that the man known for donating money to charity was arrested by police in Kabalagala this morning, Wednesday, December 13. Kampala Metropolitan deputy police spokesperson, Luke Oweyesigyire, said the socialite shot a one Victor Bitwire who is currently undergoing treatment at Kampala International Hospital. “Bitwire was shot in the shoulder at about 2am in Buziga at the premises of Bryan White Kirumira,” Oweyesigyire said. He said the socialite in under police custody as the force investigates circumstances surrounding the shooting. Bryan White has in the recent past been spotted in the company of AK-47 wielding men. There are also photos that went viral on social media showing the pencil thin socialite being guarded by policemen in plain clothes holding automatic rifles.